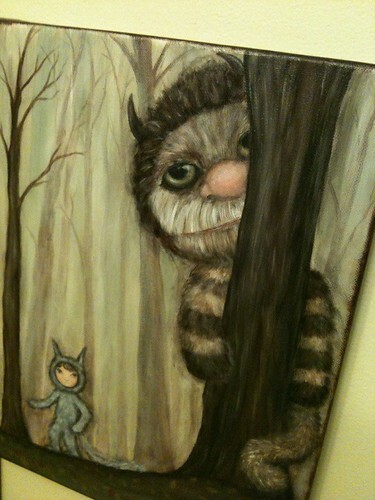 Finishing up a new painting tonight inspired by the book Where the Wild Things Are. I loved the book as a kid and wasn’t at all disappointed with the movie adaptation, unlike some other recent children’s books that have become blockbusters. Ahem, Mr. Burton, I’m looking at you. While I thoroughly enjoyed painting those terrible yellow eyes, I did run into a bit of trouble while painting the edges of the canvas. I usually paint the edges a dark brown or whatever color works with the painting, so that you can hang it without necessarily needing a frame. Easy enough -except when you DROP the canvas on the floor. Face down, of course.